Tonight we talk about “Fletch”, the 1985 comedy caper starring Chevy Chase, Tim Matheson, M. Emmet Walsh, Dana Wheeler-Nicholson, and Geena Davis (in a small role as Larry, Irwin M. Fletcher’s go-to gal). 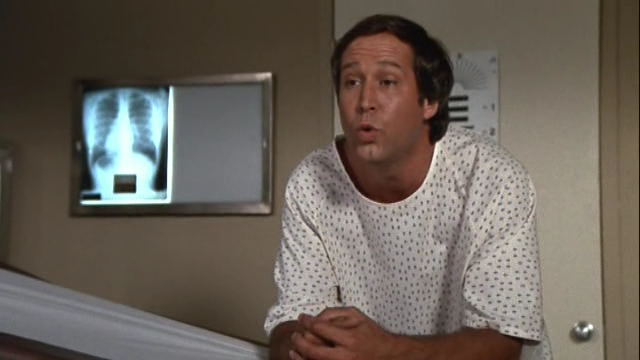 Now “Fletch” is interesting for Andrew and me because it was part of a holy trilogy of movies we would run at the video store. Whenever we needed a pick-me-up, something to lift our spirits, we would play “Fletch”, “Glengarry Glen Ross” (of course), or “Clerks”. We would run other stuff like episodes of “Mystery Science Theater 3000” (from my personal collection), cool action movies like “True Romance” or “Die Hard”, or science fiction. Most mornings I would have to open, I stopped at a diner around the corner, grabbed breakfast, and turned on “Neighbors”, the 1981 comedy starring John Belushi and Dan Aykroyd. That was a great wake-up movie. My customers loved me, for the most part. They would bring me coffee and treats all the time. I even dated a few. Very few of our customers were annoying. There was that one old lady who was offended by the language in “Clerks” and demanded that we turn it off. Those were the days. P.S. Have a nice day!